The paradox of film is sometimes the transition between the natural ability of the photograph to record a piece of reality and the more artificial ones of the image making apparatus called cinema and it´s ability to modify. Single, sometimes longer shots of an urban landscape at the edge of Montreal: Building lots, scaffolded Buildings. Deserted houses are for sale. Multi lane highways appear like the veins of a big city. Except in moments were some anonymous persons appear alone in front of the camera, this region appears almost deserted. An endless flood of vehicles are passing by. Occasionally rather atoms than traces of individuality appear. 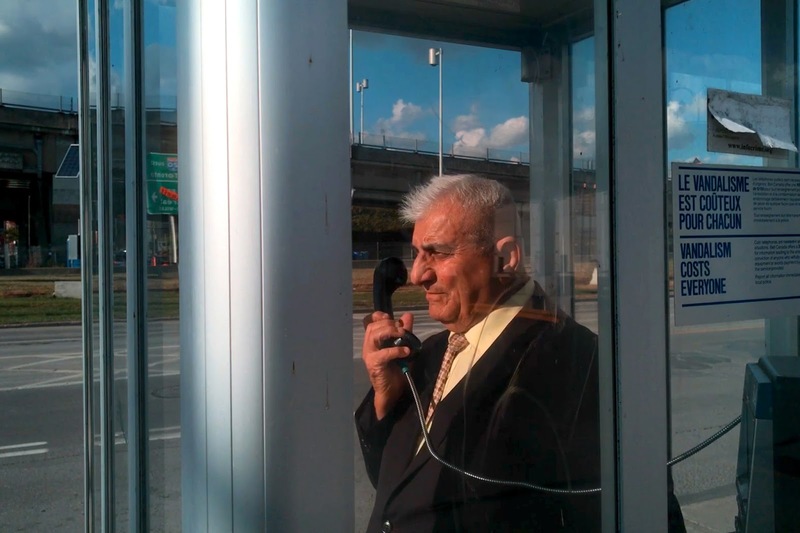 An elderly man behind a telephone booth. As we can´t hear if he really makes a call (he keeps the phone far away from eyes and mouth) the scene looks like a pantomime. Another man is phoning someone and the fragment from his conversation does not give any idea about him or to whom he is talking. Tiny fragments of human lives disappear almost completely after the next cut. They are literally drowned by the omnipresent noise of the traffic. One of the dominant colours is the red of the brick stones of some houses. Slightly accented, they evoke in me a delusive warmth and coziness in this down-and-out neighbourhood. Emblems and commercials often in form of neon signs or poster of Coca Cola promise a shine which already has left this quarter long time ago. In many shots, the environment is reflected in shop windows, windows of restaurants or coffee shops which are sparse frequented. There are very few moments or better traces of landscape which give a small idea about the natural landscape which is almost totally suppressed by urban landscape. Nature absorbed by civilization. What has won me over in this film is this strange subtle sliding between this very concrete region of a very concrete city and often it´s turn into a nearly dreamlike landscape. Especially in moments recorded at evenings or nights which are just lighted by the artificial light of the city and the neon light of shops, pubs or restaurants, the film appears like a dream. The moments when single persons appear, children, old women, young women, old men and young men, are fascinating in a strange kind. The camera remains staring at their faces for a while. The people literally are doing nothing, than staring back, but obviously they are aware of the presence of camera and the filmmaker at the same time. And it is this staring back which finally preserve their anonymity. They remain strangers like we encounter while strolling through foreign cities. The question the film evokes in my mind is - where is this joint between a rather prosaic film observation and the strange dreamlike engrossing aspect? Actually these verses remind me in this special feeling (probably only film can evoke) for the fleeting of time – for example in a film by Ozu. But the many drivers hidden in their cars again appear as impersonal, as anonymous like their vehicles. Interchange is quite a proper film to open a film festival, because it deals at all with the core of cinema, the seeing itself. Sometimes the visual culture of cinema with it´s long and complex history has to go back ti it´s initial origin just to remind us that film is “the art of seeing”.